With so many customizations and options available to you, we have collected some useful tips we believe may be helpful to you. EZ Dock is delivered with a 13.5" free board (the distance between the top surface of the dock and the water). Some dock applications are better served with less free board, such as docks used by rowing teams. It is easy to adjust the free board and we simply put a removable "plug" in each dock in the coupler pocket and pump water into the dock until it provides the desired free board. Using a plug with threads the water can be removed by simply reversing the process. This installation uses a 5" free board which provides rowing teams easy access on and off boats. Any PWC with reverse makes it easier to bring the nose of the Waverunner to touch the first roller in the water. Once you have come to a stop with the nose of the Waverunner against the roller then accelerate and "climb" the machine onto the dock. Hitting the first roller or either side of the dock near the roller while moving can damage the hull of the Waverunner. A hinge kit comes with two connection points - each hinge has a hinge plate and a J Bracket. The J Bracket attaches to the EZ Port by inserting the J Bracket in the top pocket with the hardware connector in the bottom pocket. This secures the part of the hinge that is mounted on the EZ Port. The other half of the hinge is a flat bracket that has holes for lag bolts. The two pieces ( J Bracket and Hinge Plate) are joined using a hinge pin which slides through the two pieces and is secured with a cotter pin. Once installed It is easy to remove the Port from the floating dock - you simply pull the cotter pin out and slide the pin out - and your EZ Port is disconnected. The "key" to a successful installation is marking the location for the lag bolts. while standing/kneeling on the EZ Port hold the hinge plate against the existing floating dock and mark where the lag bolts will be located. KEY - you must have your weight on the EZ Port and no one on the dock you are attaching to when you mark the position for the lag bolts. This negative load will then insure that when your PWC is on the EZ Port the back end will rise and keep the jet drive completely out of the water. The negative load on the installation when marking the spot for the lag bolts is critical. 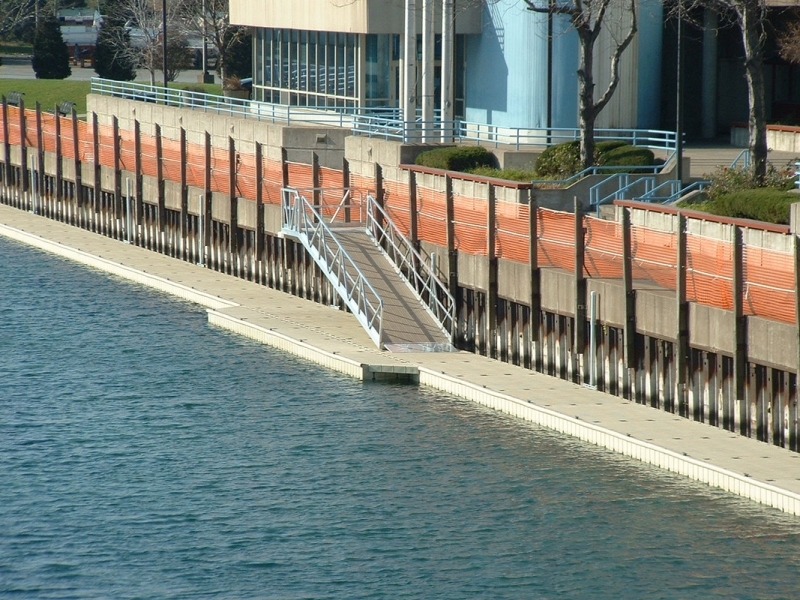 Note: Depending on the free board of your existing floating dock the hinge plate can be mounted in the up (raised position above the J bracket) or at the same height as the J Bracket. One hinge kit is adequate for securing up to three EZ Ports depending on the degree of rough water at the site. We hear from customers that it is difficult to launch their watercraft and they have to strain and lift the machine with one or more people pushing. 1. 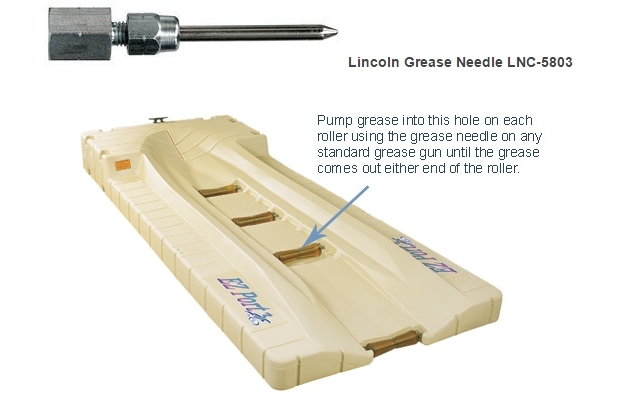 Grease the rollers each year - this requires a special tip that will fit on any grease gun and you can use the Lincoln Grease Needle LNC-5803 (see photo below). This part is available from many online tool stores on the web (google the phrase above). The cost with shipping is approximately $14.25. 2. 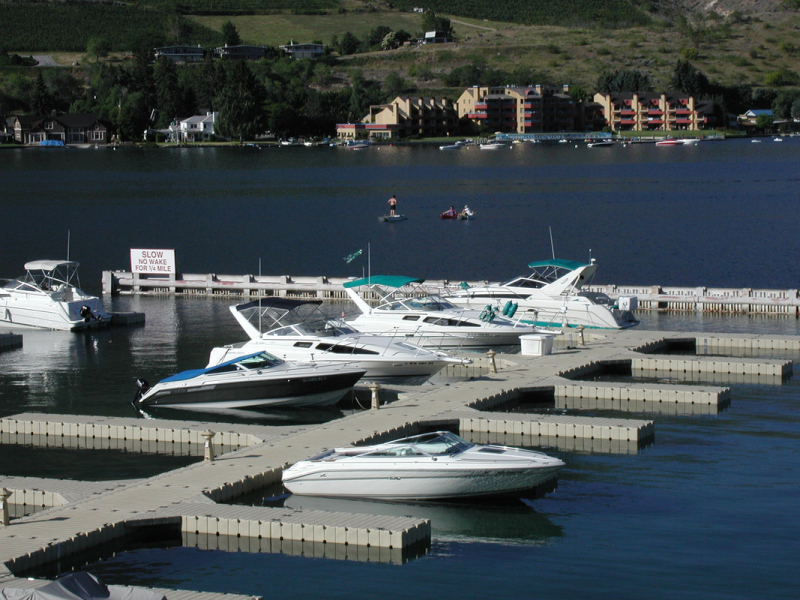 Adjust the rollers - the watercraft should be resting on the rollers, not the dock. 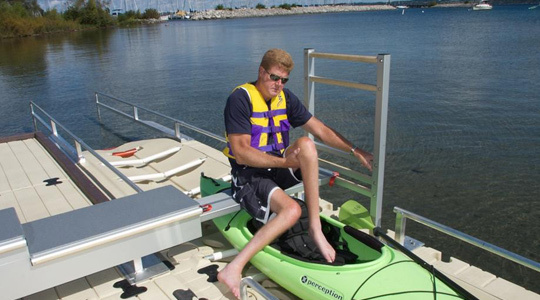 If they are adjusted properly the machine will rock slightly from side to side when on the dock which keeps the watercraft off the dock while launching or docking. There are several roller adjustments you can make that either raise or lower the rollers with the third roller (on the Port 3) the most critical. To keep your docks looking like new simply use a power washer and use the high pressure stream of water to remove dirt and grime. A good high pressure power washer should clean your docks without any soap or cleaner most of the time. The industry's first dock ladder to remove itself automatically when not in use is now available for fixed and floating docks. 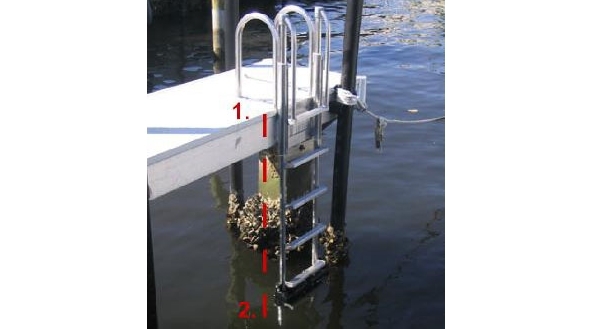 Gone is the marine growth and barnacles that have been a part of every ladder prior to the introduction of the FloatStep ladder. 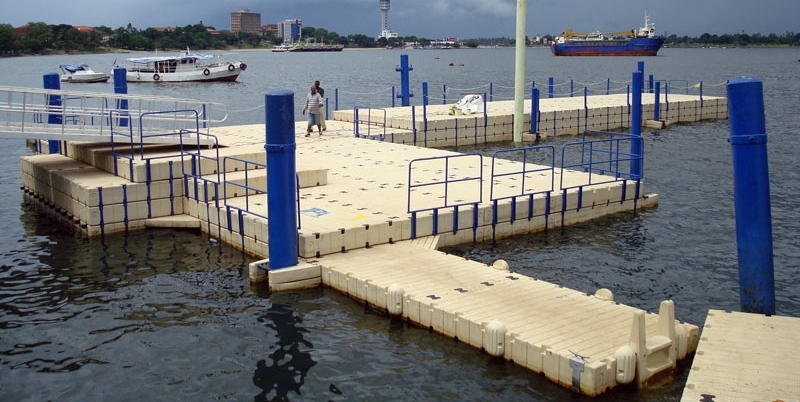 If you need a floating dock with different heights EZ Dock can be stacked two, three or four levels high. This is a common application when different levels are required for boarding different boats that have different heights. One section of the dock could have a 13" free board, another 26", another 39". 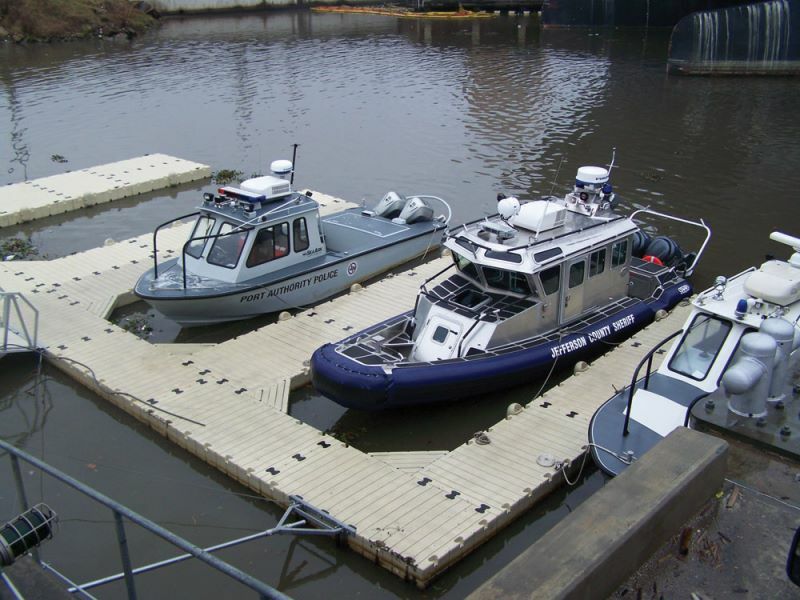 Your EZ Dock Dealer can assist you in the hardware required to accomplish this type of installation. Often times commercial transport applications required different levels of dock for loading. When installing the skate wheel roller and spacer for difficult to move machines make sure the roller is placed in this position on each side of the Port Max. This will provide the best platform on which to roll the machine, especially the more difficult hull of some of the Yamaha PWCs. Every PWC should roll easily on and off the dock using this wheel position. Ice has no affect on the EZ Dock System. 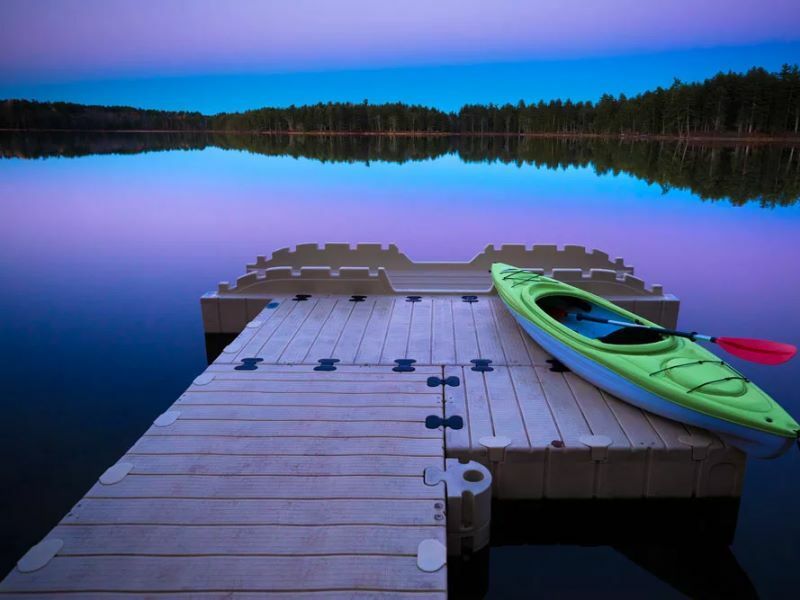 Since an EZ Dock requires only an inch of water to float, the docks will "pop" to the top of the ice when the water freezes, much like an ice cube tray. his picture was taken at the camp after a 20" ice condition for most of the winter which had no affect on the EZ Dock System. The only time you should have concern with ice conditions is when there is a significant ice flow since this often takes pilings and other anchoring systems with the ice flow as well as the dock system. 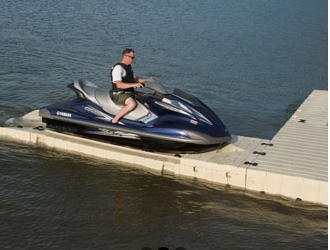 If you want to remove the docks for winter storage it is easily accomplished using the EZ Dock Dock Wheels (Part# 90050 - pictured below) which attach to the docks and allow you to "tow" the docks while connected from the water to land. Another method of removing the docks is to place PVC pipe on land and use the pipe as the roller system when towing the docks from the water. To uncouple EZ Dock section your will need a socket adapter tool which fits on a standard 3/4" socket drive. The tool is an adapter that will fit the coupler nut that holds the top and bottom coupler together between the dock sections. The socket adapter has a star shapped pattern that is designed to fit into the same pattern on the coupler nut. The black couplers (some people call the dog bones due to their similar shape) consist of a top coupler, bottom bottom coupler and a black plastic poly bolt and nut. The only "trick" to taking the dock sections apart is not to lose the bottom coupler which can fall out if you do not use a string on the coupler bolt for retrieval (see note below regarding string). Simply back off the plastic nut and remove the top coupler with a flat screw driver prying it out of the dock pocket. This will expose the black poly bolt that is left - do this for each coupler in the line that is holding the one dock section together. Only disconnect one dock at a time. Remove only one row of coupler nuts at a time (one dock section at a time). Once you have the nut and top black coupler removed tie a string using a "slip knot" around the threads of each coupler bolt that is exposed and replace the coupler nut over the string. Stradling the two dock sections that are joined rock the docks and the coupler bottom and bolt will fall out. Keeping the string in your hand pull the string between the docks and bring the couplers to the top of the dock (otherwise the bottom coupler and bolt will fall to the bottom - they do not float). Pipe brackets can be removed in a similar manner - the Heavy Duty pipe brackets use couplers, the Light Duty pipe brackets use screws to join the upper and lower pieces. Piling brackets can be disconnected easily. Hinges kits simply have a cotter pin and straight pin that is removed to separate an EZ Dock that was connected to a wood dock. Cleats on a dock make it easy to secure the dock section after it is disconnected from the system and the cleats are strong enough to allow a dock section to be lifted by dock lines on the cleats if you have a way to hoist the dock section. Otherwise just pull the dock section on to what dock is left and then carry it from the water via the gangway or beach path. Many times a cracked or punctured EZ Dock section can be repaired by simply melting the polyethylene dock material with a torch or plastic welding iron (a large hot metal iron that melts the plastic together). Occasionally we have customers that have punctured or cut the dock with bullets, boat propeller from an outboard engine or some other accident and we use an old dock section to piece a repair and melt that into the open hole. If you have stress cracks near coupler pockets they normally occur after constant large storms due to extreme pressure on the dock. At times these cracks can be repaired in the same manner, melting the material together, but if it is in place that receives a lot of stress it may not hold. 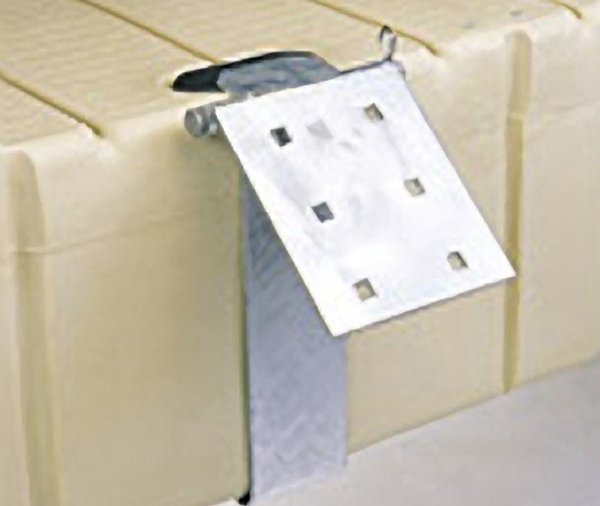 The EZ Dock system includes couplers which are designed to break before a dock section cracks which is the reason the docks are provided with an 8 year warranty. EZ Dock is the most durable dock system available today and issues regarding cracks from storm damage are extremely rare. You also have a "weep hole" on the end of each dock section that allows the dock to change pressure inside as atmospheric conditions change outside. At times in rough water we have seen water enter the docks through the weep hole but this is normally in salt water applications where waves are bouncing off a bulkhead and back into the dock system. 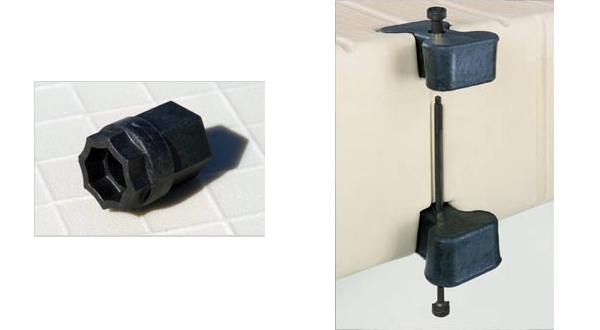 This year EZ Dock introduced a new vent (see attachment) which can be used that will prevent any water from entering the dock regardless of rough water conditions. These can be inserted into a hole in the end of the dock while you seal the original "vent hole" that has been included since the docks were invented 20 years ago. You can plug the old vent hole with any silicone material similar to bathtub caulk. Draining docks is a simple process - drill a hole in one corner on the edge of the dock near the top, drain the water, and purchase a threaded plastic plug from Home Depot of the same size you make the hole, the plug will prevent water from entering the dock through the drain hole you created. Since the entire dock section is an open chamber only one hole is required to drain the entire dock. Sometimes it may become necessary to re-program your remote transmitter. It is possible for the transmitter to de-program either due to loss of power (dead battery), or electrical interference. If your remote will not work, first check to see that it is transmitting. Do this by depressing any of the three buttons and watching to see that the red LED light is working. If so, then the next step is to re-program the receiver. 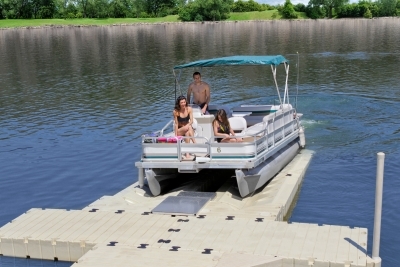 EZ Dock is designed to move "with" rough water much like a catepillar moves across a surface. If you want to see the advantage in using EZ Dock visit our gallery of videos and watch EZ Dock in a hurricane.